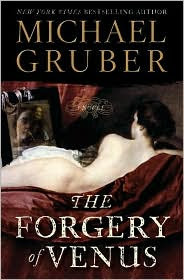 THE FORGERY OF VENUS is a very intriguing, compelling, oddly told tale! It begins with a man being given a CD to listen to by a friend from the past. "I am being watched! Here, take this!" and the friend disappears. So begins the story of Chaz Wilmot as he narrates, via the recorded story the friend is listening to, the strange occurrences of his life. Chaz is a painter, highly talented, so talented he can paint exactly like the 'old masters'. But he is stuck in an advertising world because no one in the modern art world appreciates his talent. His life takes an abrupt change when he agrees to be part of a drug study. During the study, that includes participants in all of the arts, Chaz is given a drug. This drug allows him passage in his mind to the past. Chaz finds that it's not only his known past, but a past of the 17th century, living the life of Don Diego Velazquez of Spain. He continues to live his confused life in the present. He is commissioned to refurbish a fresco in a Venetian palace. This brings him to the attention of a shady character with ties to a Nazi past. The Nazis who stole artwork from the Jews. Ooh. Ok, I've had this one and heard mixed things about it, but I think you might have made me want to read it. Great review! I have this on my TBR due to another positive review I read. I don't read many thrillers, but this one has enough twist to make me interested. Vickie, I think I'll have to put this on my list to read or listen to! Thanks for the review! Sherri: It's odd, but good.